I wanted to leave a comment, but I don't know what to say. Speechless. HA HA HA. 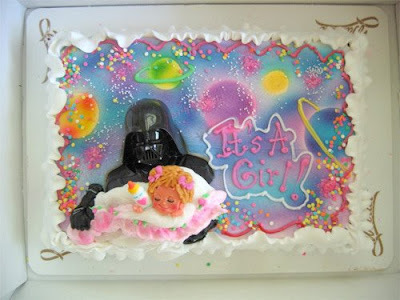 With that being her BIRTH cake I wouldn't be surprised if her name was Bobba or Jabba. Hell, with the sensibility on display, her name is probably Jar Jar. It's the "It's a girl!" that really makes it. Glorious.